This week, MexCocina brings you shrimp, by the bucketful! We're starting you off with two excellent appetizer recipes. The first, Shrimp in Avocado Boats, originated in the Mexican seaside resort of Puerto Vallarta. My parents turned my sister and I onto this delectable edible back in 1967. The second appetizer is called Drunken Shrimp, because the camarones, as they're known in Spanish, are cooked in beer and spices. You won't want to miss this one either! From here, we're moving on to some main courses that feature shrimp. We have Garlic Shrimp on Skewers, Isla Espirit� Santo Prawns with Salsa, Batter Fried Shrimp Mazatl�n Style, and Shrimply Delicious Shrimp Tacos. All these recipes are easy to make and guaranteed to get you rave reviews. I've included estimated preparation times, so you can know how long ahead to get cookin'! I've also given you some ideas for what to serve with these entrees, so you can serve up a delicious, totally Mexican meal (or four) this week. Or next week. Or the week after. So, go for it! And enjoy! My family was first served this appetizer over 30 years ago at the old Hotel Oceano on the malec�n (ocean-front board walk) in Puerto Vallarta. We munched on these as we sipped frosty Cokes and people-watched at sunset. Once he figured out how to make them, my dad would whip them up on our camping trips to San Felipe over Easter break, using fresh shrimp just hauled in by shrimp boats right off the coast. For those who don't eat shrimp, the avocado and sauce are perfectly awesome by themselves. Makes me salivate to even think about it! This recipe is supremely easy to prepare and only takes five to ten minutes! Serves eight-and trust me- it's to die for! Place avocado halves on small plates. In small bowl mix cocktail sauce, lime juice and chili powder. Fill the hollow left by the seed with cocktail sauce. Heap shrimp over the top and serve. In Spanish, Drunken Shrimp are called "Camarones Borrachos." This recipe is also super-easy to prepare. It will take you about 15 minutes altogether. Drunk Shrimp got its name because the shrimp are lightly spiced with herbs and beer. The name alone makes for great party chatter and the flavors are guaranteed to make your guests happy! My dad and his friend and camping buddy, Ben invented it in a very basic form on one of family treks to Kilometer 181 in northern Baja California-a deserted (back then-in the '60s) stretch of rugged, spectacular coast accessible only by twelve miles of gnarly washboard road, which was always washed out in places and guaranteed to gift someone in our caravan with a flat tire! Like many of my recipes, it's been jazzed up over the years. Serve this family specialty as a mid-afternoon snack or with cocktails in the evening-and don't forget to tell everyone what it's called! Combine beer, onion, lemon juice and spices in large saucepan. Bring to boil. Reduce heat and simmer, covered for ten minutes. Drop shrimp into stock and bring to boil. Reduce heat again and simmer three to five minutes, or until shrimp are pink. Remove shrimp from stock and allow to cool briefly. To eat shrimp, hot or chilled, simply shell and dip in cocktail sauce or melted butter as desired. Garlic shrimp is my kids' dad's absolute favorite Baja dish. When we were married and traveled to Los Cabos, he'd eat it at least once a day. By the fourth day we had to turn the air conditioning off in our hotel room and leave all the windows open because I couldn't breathe when we were together in a closed room! He didn't even need to open his mouth! The garlic was so overpowering it literally oozed out his pores and swirled around in circles around him! This shrimp is skewered, saturated with garlic and cooked over hot coals. You can prepare the skewers up to three hours ahead, so that your actual "prep time" before dinner is only a few minutes. Be sure and put your baked potatoes in an hour before you're ready to eat, though! Serve as a main course with buttery baked potatoes, a big green salad and a chilled white wine. Serves six to eight, depending on their appetites. In small bowl, combine garlic, wine, lemon juice, cilantro and melted butter or margarine. Place shrimp in 9 x 14 pan. Cover with marinade. Refrigerate up to three hours. 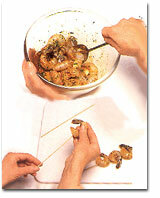 When ready to barbecue, place the shrimp on skewers, making sure that they are well saturated with the marinade. Grill for three minutes on each side, basting frequently with marinade until done. Directly to the west of La Paz in southern Baja is a large island with at least 12 separate, pristine, uninhabited bays. When I saw them from the airplane on a recent flight south, I counted. Twelve-and I only counted the big ones-on the west side of the island. Named after the Holy Spirit, Isla Espirit� Sant ois is famous with divers all over the world. You can catch a dive ship from downtown La Paz, or at any of the local hotels. You can pick your bay. Or, you can catch a panga (a wooden skiff with outboard motor) at Playa Tecolote and ride over there to snorkel with the sea lions that live at the north end of the island. Whether you're a diver, a snorkeler, an avid fisher person or just a Baja cruiser, Espirt� Santo Island is a must-see. We visited many of its bays on our forays out into La Paz Bay when I was a little kid. They still offer up the amazing undersea life and equally amazing shell-hunting on land that they did 35 years ago! This spicy, saucy dish is pure La Paz. More cosmopolitan and sophisticated than the usual Baja fare, you will find it worthy of any five star resort. So, hey, dress up tonight and try this for a dinner party with an upscale Southern Baja flair. You'll love the unusual flavor of the shrimp. Served on a bed of rice, it's almost a full meal in itself. Precede it with a medley of appetizers and serve with a Marinated vegetable salad, a plate of steaming corn tortillas and chilled Corona beers with a lime. Sinfully delicious and it only takes 20 minutes to prepare, including the rice! Serves six. In large saucepan, cover shrimp with wine and water. Bring mixture to a boil. Add garlic and lemon. Cook three to five minutes until shrimp turn pink. Drain shrimp. Rinse well with cold water. Shell and devein shrimp. Heat salsa in small saucepan. Serve shrimp on a bed of white rice topped with heated salsa. Garnish with cilantro and lemon slices. Mazatl�n is a busy resort, seaport and industrial city on the west coast of mainland Mexico, just south of the tip of Baja. It was one of Mexico's first beach resorts back in the early '60s and is still a favorite destination for American college students during Spring Break, and a major stop on all Mexican Riviera cruises. We spent a few Easter vacations in Mazatl�n when I was a kid, enjoying the sunny weather, warm water and relaxed, friendly ambience. The last time I was there, every night the tourists converged en masse on one of the town's premier eateries, the Shrimp Bucket. My father swears it has the best fried shrimp served anywhere. This is our version of the dish, which my family figured out together. Try it with a Cabbage Salad, fried potatoes and-of course-cold beer! Takes less than an hour to make the entire meal. Serves six. In small bowl, mix eggs, lemon juice and cilantro. Dip each shrimp into the egg mixture and dredge in bread crumbs combined with garlic powder and seasoned salt. Heat oil in skillet over medium high heat. Fry each shrimp about two to three minutes, or until crisp and golden. Drain on paper towels and place on platter in oven on warm until ready to serve. These days, in Mexico and in California, Shrimp Tacos are a favorite item on any menu. The shrimp here is spicy and lightly saut�ed in butter, garlic, chiles and lime juice. Regarding the heat of those chiles-actually, you can make the shrima as hot or mild as you like, depending on how many chiles you use. If you hate it hot, leave the chiles out. If you like it medium-hot, be sure to remove all seeds from the chiles-that's where the heat is. If you like your food really hot and spicy-then leave those seeds in! This recipe is for soft tacos, which are not fried. Shrimp tacos are best served with fresh corn tortillas and a variety of condiments and salsas. You can have this meal ready in a half hour. Heat up a can of refried beans to go with it, make a quick salad and Voila! You're happening! Makes 12 tacos, enough for four to six people-depending on how hungry they are. Heat all ingredients in medium sized saucepan. Heat tortillas in the oven or microwave until hot and pliable. Fold and fill in the same way as you would fried tacos. If your tacos seem inclined to fall apart, try using two tortillas for double the strength. Serve immediately, with a variety of condiments. Yum! Yum!